As a clean energy leader within the agricultural industry, New Holland has pioneered the use of biodiesel in machinery since 2006 and is currently researching the most advanced technologies from around the globe. 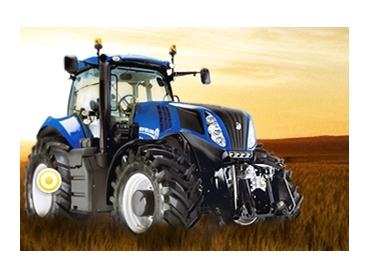 Since developing the award winning NH2 concept tractor New Holland was the first to use hydrogen fuel cells, and introduce the Energy Independent Farm concept. In 2011 the next level of diesel exhaust emission regulations (Tier 4A) became a requirement for medium- and heavy-duty engines above 174hp (130 kW) across Europe and North America. Once again, New Holland is at the forefront of the industry in Australia with ingenious solutions that make farming productive and more efficient while respecting the environment. “Currently all on-highway vehicles are legislated for emission control in Australia, and whilst off-highway vehicles are not, this is likely to be different in the very near future,” said New Holland’s Product Manager for High Horsepower Tractors, Don Forrester. As part of New Holland's strategy, Selective Catalytic Reduction (SCR) technology has been adopted for tractors with engines above 100hp. With the new technology you can operate a Tier 4A compliant tractor for 100 days and produce the same amount of exhaust emissions as a tractor would have produced in just one day, back in 1996 at the Tier 1 standard. SCR technology is currently being deployed in New Holland’s latest new model tractor ranges, the T7, T8 & T9 Series tractors.